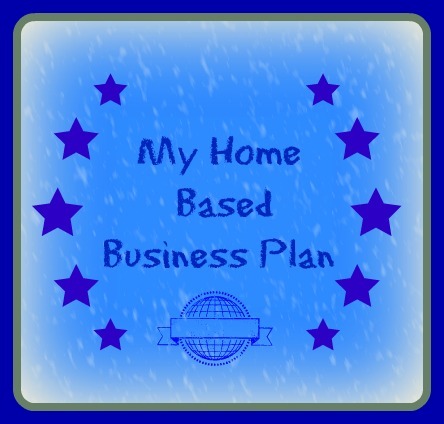 A home based business plan provides us with the foundation for a terrific new company. We all know the story about how Steve Jobs started Apple in the garage. It was a very tiny company with a big dream. 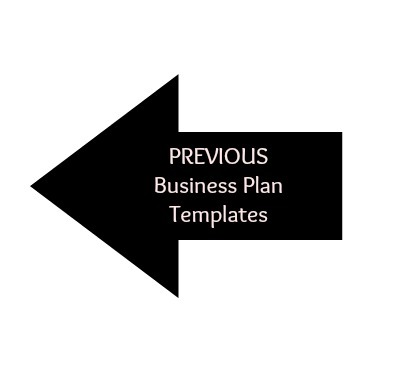 We're going to continue our discussion here of how my free business plan template is a good tool for your home based business -- as you begin to start your planning, this one tool can help you tremendously put a lot of information into perspective in a short amount of time. So now you've been reading your favorite website (Business Ideas Connection - ha! ), and you have discovered a terrific business idea that is a great "fit" for you, your skills and interests! You're wanting to pursue this idea further, but (maybe) you're uncertain about what to do next? The road map you are looking for is a simple and concise home based business plan. 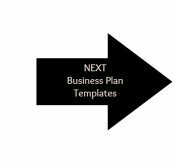 If the idea of producing a 25-30+ page business plan is intimidating to you (and it should be! ), then I recommend you start out with my simple one-page business plan. This is a plan, I've modified over the years to be the "Best-of-the-Best" and get to the heart of the planning process in a simple, well-organized manner. It's definitely not about the "volume" and more about the planning process and substance of getting your business roadmap in place! Now we'll move onto the second portion of my home based business plan simple one-pager and talk about the next areas to formulate your thoughts and ideas. 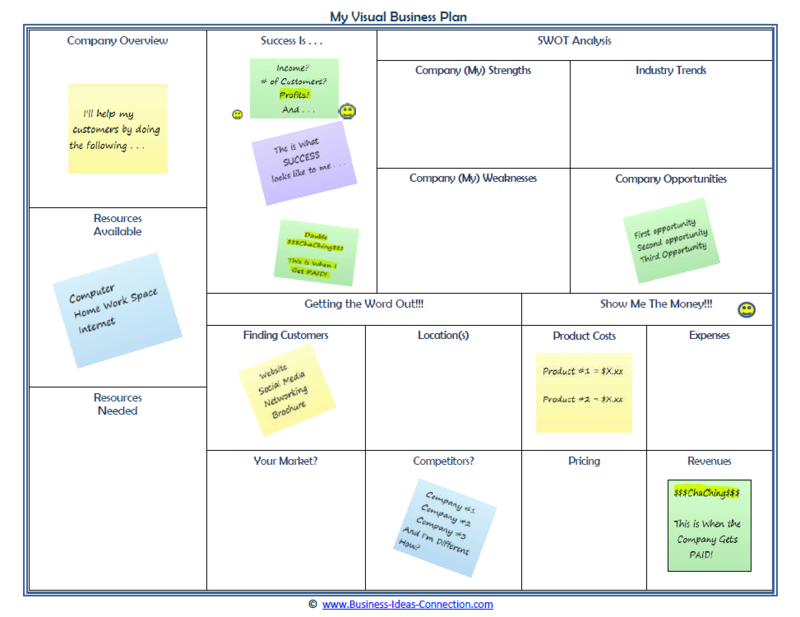 My one page home based business plan now looks at some of the "big picture" ideas. Please don't skip this part and think it doesn't apply to your small or home business. This can make the difference between your business and your competitors business!! In this Section, identify 3-5 of your personal strengths -- this is because your home based business plan is mostly just YOU since your business is smaller than a large corporation. I find this can be the hardest section for many people to fill-out.
. . . If you're struggling with this portion, ask a close friend or spouse to help you with some ideas! Nail this portion down -- know what you're good at . . . This section of the business plan is key for a variety of reasons. It's definitely not meant to "beat yourself up".
. . . Everyone of us has things we're just not to hot at -- this is what makes YOU unique! The beauty is that by identifying 2-3 of the skills we don't possess, it makes us aware of them and allows us to plan "how" we're going to work around this constraint. For example, one of my biggest constraints, is that I'm not a good "marathoner" -- going the distance over long periods of time. I am a terrific "sprinter" -- handling tasks in quick short bursts, then tiring! I have to really focus my efforts to work steady and not burn myself out!
. . . Again, if you're struggling with this part of the plan, ask your spouse or friend. And write this from a "positive" perspective. Never be negative with yourself! "What will I do to overcome this in my business?" "Can I learn this particular skill? 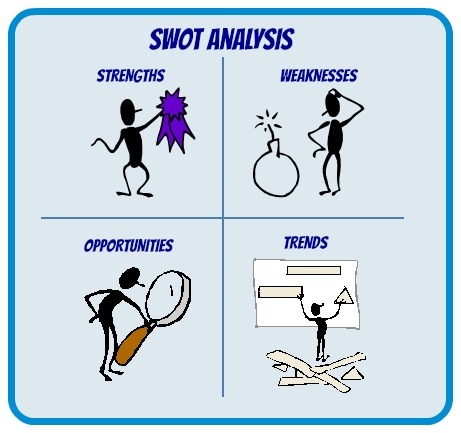 When filling out your home based business plan, write down 3-5 terrific opportunities that are present now. And how you will take advantage of these opportunities. How will I provide products/services that solve my customers problems? What is the current demand for your product/service? How can I better help my customers vs. my competition? Record your answers -- this is the information that will help you with your marketing and/or educating your customers as to why they should do business with you! The final portion of this section is identifying the trends -- both societal and industry trends. These are what's shaping the future. Overall trends are so important to businesses -- this is what fosters new business ideas and growth opportunities for current businesses. Take a look at the demographics, social, business, and industry trends. But are you aware there is a much larger demographic coming up that is bigger than the Baby Boomers? They currently aren't getting as much "press" time as the Boomers, but they will change the world in even larger ways than the Boomers -- these are the Millenials, Generation X, 20-somethings!
. . . Does this fact impact your business plan? Take a look around -- study what's going on in the macro-sense. Does your business idea ride a wave? Or is it crashing into the surf?